England’s World Cup campaign ended with a nine-wicket victory over Afghanistan in a rain-affected match in Sydney. Already out after one win from five games, they opted to bowl and had the minnows at 20-2 by the first stoppage. Chris Jordan and Ravi Bopara both took two wickets and the Afghans were 111-7 in the 37th over before rain revised England’s target to 101 from 25 overs. Alex Hales, dropped on 0 and 12, hit two sixes in 37 and Ian Bell was 52 not out as England won with 41 balls left. 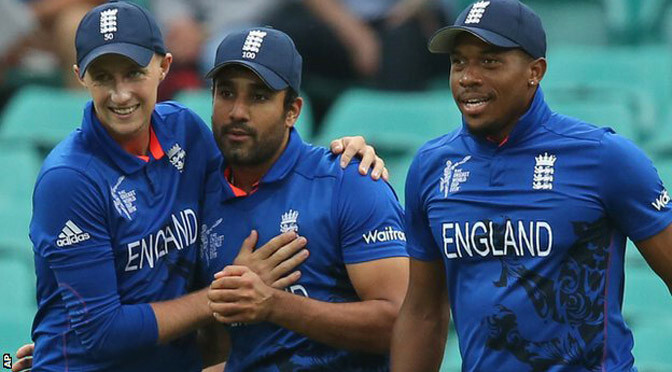 Set 276 to win, England were bowled out for 260 despite Jos Buttler’s 52-ball 65, while Rubel Hossain claimed 4-53. Bangladesh had earlier posted 275-7 in Adelaide thanks to 103 from Mahmudullah and Mushfiqur Rahim’s 89. Coach Peter Moores said he felt “hollow inside” and “hugely disappointed” following England’s demise. Bangladesh’s victory also secured Sri Lanka’s place in the last eight, alongside Pool A winners New Zealand and Australia. In losing to every Test-playing side in Pool A – their only win has come against Scotland – England have put in their worst showing since a first-round exit on home soil in 1999. Even then, they managed to beat defending champions Sri Lanka. Sri Lanka, along with Australia and New Zealand, are three sides to have dished out heavy defeats to England in this tournament, but all three are ahead of Morgan’s team in the world rankings. England slipped to a third crushing defeat in four World Cup games as Sri Lanka comfortably chased 310 to win by nine wickets in Wellington. 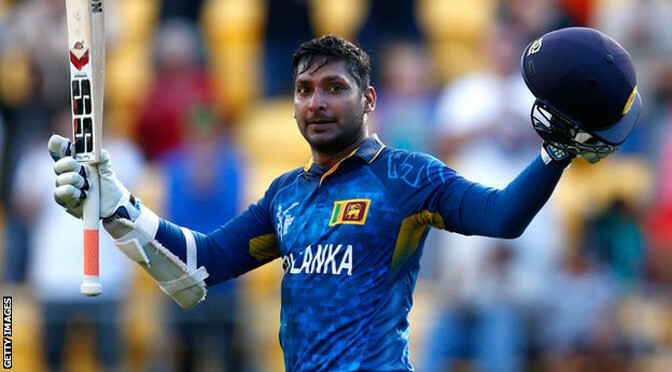 Lahiru Thirimanne hit an unbeaten 139 and Kumar Sangakkara 117 not out to seal victory with 16 balls to spare. Earlier, Joe Root made 121 as England accelerated late on to post 309-6. But Sri Lanka showed that to be nowhere near enough and England will almost certainly be eliminated if they lose either of their final two games against Bangladesh and Afghanistan. If opening defeats by Australia and New Zealand and victory overScotland were expected, then this fixture was supposed to be the best indicator of England’s chances of progressing far into the World Cup. As it turned out, a third one-sided reverse at the hands of Test opposition leaves England clinging to their hopes of reaching the last eight. Indeed, if Bangladesh beat Scotland on Thursday, then England will go out if they lose either of their remaining group games. While their previous game in Wellington, an eight-wicket thrashing by New Zealand, was humiliating for its rapid nature, this latest loss was perhaps more dispiriting. England put in their best batting display of the tournament thanks to Root’s accumulation and creativity and Jos Buttler’s late power. But Thirimanne and Sangakkara made a mockery of the chase as England’s pace-dominated attack struggled to make chances on a sluggish wicket. When they did create opportunities, they were not taken. Thirimanne was dropped on three by Root at slip, although the edge off Stuart Broad should have been claimed by wicketkeeper Buttler. The left-hander also had a let-off on 98, Moeen Ali failing to take a low chance in the covers off James Anderson. After that, Thirimanne, whose innings was laced with classy cover drives, became the fourth Sri Lanka batsman to score a hundred in this World Cup. He shared an unbroken stand of 212 with Sangakkara, who moved third on the list of World Cup run scorers with a 70-ball century, scoring through 360 degrees. On the completion of the chase, Sri Lanka – 10-wicket winners against England in the quarter-finals of the last World Cup – became only the second team to overhaul a score of 300 or more with nine wickets in hand. It also cemented England’s unwanted record of being the least successful of all the Test nations when defending a target in excess of 300. That Eoin Morgan’s side posted their highest total of the tournament came as a result of 24-year-old Root becoming the youngest England batsman to score a World Cup century. Given a good start by Ian Bell’s 49, England were pegged back as Sri Lanka’s attack improved by taking pace off the ball, Tillakaratne Dilshan having Gary Ballance caught and bowled to extend the left-hander’s poor sequence to only 36 runs in four innings. At 101-3 in the 21st over, Root arrived to stabilise the innings with Morgan, with the Yorkshire batsman – dropped on two at slip – then dominating a stand of 98 with James Taylor. Strong square of the wicket, Root reached a fourth ODI hundred at a run a ball, then accelerated by inventively reverse-sweeping the seamers. After Root fell, England were pushed past 300 by Buttler. Their total seemed competitive, Thirimanne and Sangakkara proved that it was not. 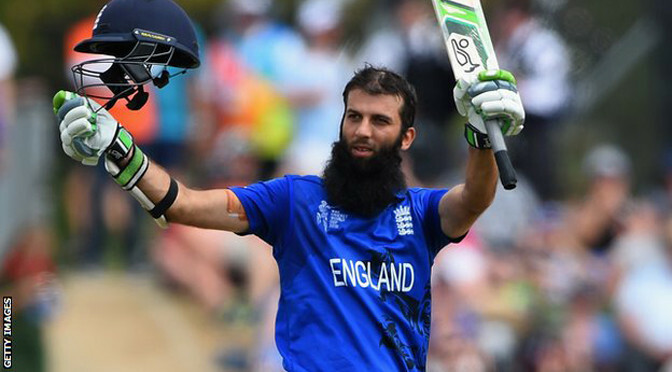 Moeen Ali’s century led England to a 119-run victory over Scotland and a first win of the World Cup. Moeen scored 128 and shared 172 for the first wicket with the stuttering Ian Bell, who contributed 54. But, when they were parted, England could only manage 131 runs in the final 20 overs as they posted 303-8. Still, it was too many for Scotland, who never threatened an upset, despite Kyle Coetzer’s 71, and were bowled out for 184, with Steven Finn taking 3-26. Following heavy defeats against co-hostsAustralia and New Zealand, the success in Christchurch provides England with a much-needed morale boost. However, little can be learned as to whether England are in better shape for the sterner tests to come – starting with Sri Lanka in Wellington on Sunday – given the nature of the opposition. Scotland are the lowest-ranked one-day international side in Pool A and slip to the bottom of the table following the three-wicket defeat by New Zealand in their opening game. Preston Mommsen’s side face Afghanistan on Thursday, likely to be their best chance for success in the tournament. Still, there were times when they troubled England. An attack which began poorly improved to take eight wickets in the final 20 overs and ensure that Eoin Morgan’s men did not fully capitalise on a platform of 172-0 after the first 30. At one point around the beginning of the batting powerplay, England lost three wickets for two runs in three overs, Moeen being caught on the leg-side boundary from the off-spin of Majid Haq, Gary Ballance continuing his poor run by chopping on to his own stumps and Joe Root edging behind. Before that, Moeen, who gave a half-chance to cover on only seven, scored freely, particularly through fierce pull shots and lofts down the ground. His 107-ball knock included five sixes and 12 fours and his second ODI century is also his highest score. In contrast, Bell never looked fluent, scratching his way to a half-century in an 85-ball innings that contained only two fours. It was Bell’s wicket, caught at extra cover off the medium pace of Richie Berrington, that began England’s slide, a decline halted by the late impetus of Eoin Morgan and Jos Buttler. Patient at first, Morgan accelerated to a 42-ball 46, including two sixes, while Buttler contributed an inventive 24 from 14 deliveries. If the win was most welcome for England, then next will be the runs scored by Morgan, who had managed only 19 in his previous five innings. The target of 304 always seemed beyond Scotland and they never came close to pulling off a first win against a Test-playing side as they slumped to a 10th defeat in as many World Cup matches – joining the Netherlands with the worst record in the tournament’s history. Alastair Cook has been removed as England’s one-day captain. 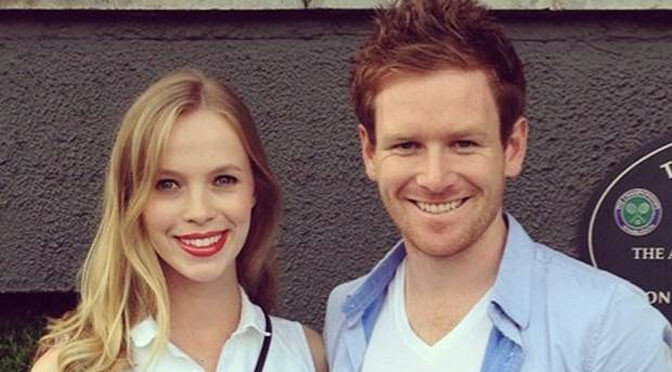 According to widespread but as yet unconfirmed reports, with Eoin Morgan appointed to lead England at the World Cup that starts in February. England’s World Cup captaincy was thrashed out during hours of deliberations at Trent Bridge on Friday as the selectors wrestled with a decision they had done everything to avoid. The ECB is expected to unveil Morgan as the new captain at Lord’s on Saturday less than two months before the start of the tournament. Cook left Trent Bridge pensive and unshaven as he began to come to terms with a likely future as a Test specialist. Cook, 29, has struggled for a long time in one-day cricket, scoring only one half-century in his last 22 innings in ODIs. England have also lost five of their last six multi-match series and the 5-2 series defeat has seen the selectors take action. Pressure has been building for much of the past year for England’s selectors to jettison Cook, as he became a symbol for England’s conservative approach to one-day cricket. But repeatedly tried to bolster his position in the forlorn hope that he would rediscover his form. That desire was based not only on the wish for continuity, but upon an underlying sense of loyalty to Cook after he had unprotestingly accepted the decision to call time on Kevin Pietersen’s England career after an Ashes whitewash nearly a year ago. Now England’s selectors have affirmed their right to choose in the face of strong expressions of loyalty towards Cook by the managing director of England cricket, Paul Downton. As recently as Tuesday, Downton, reaffirmed his belief that Cook was England’s “natural leader” and said he would be very surprised if he was not captain at the World Cup. Downton’s view that the selectors would take “more risks” if they replaced Cook might well have been accepted by those official charged with making the decision, even as they opted for change, but they have concluded that the risk is worth taking and preferable to the sense of inertia that has settled over the England one-day side. Peter Moores, England’s coach, also expressed personal support for Cook right up to the end, but a majority feeling emerged among the selectorial quartet – the chairman James Whitaker, former England bowler and Middlesex director of cricket Angus Fraser, and Nottinghamshire director of cricket Mick Newell – that Cook’s time had run out. Under Cook, who was appointed in May 2011, England won 36 and lost 30 of their 69 matches. 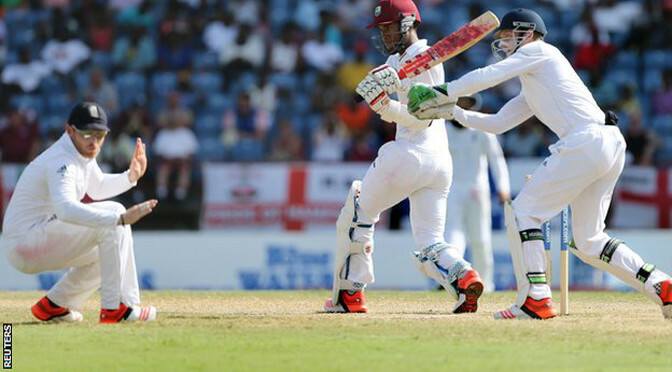 Cook hiimself has gone 59 innings without an England hundred as pressures have mounted. 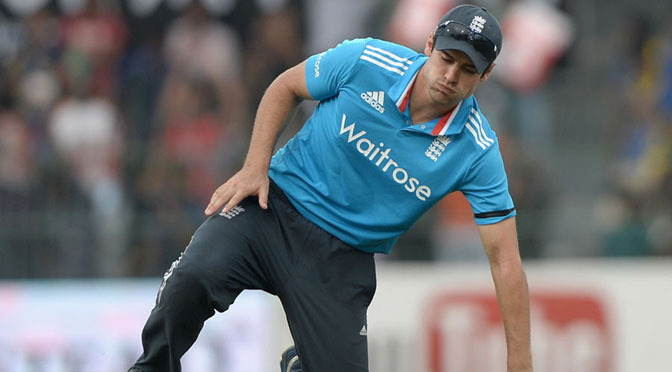 The recent slump in form from both Cook and the team had threatened to make England’s World Cup challenge a non-event. Morgan’s form has been equally alarming with only one half-century in his last 19 innings, but that half-century came when he stood in for Cook, who was suspended for a match because he presided over England’s slow over rate, during the seven-match Sri Lanka series. England lost that match in the last over on the way to a 5-2 defeat in the series. Cook’s sense of duty and strong will meant that he was not about to stand down no matter how consuming his problems in one-day cricket began, but when he indicated at the end of the Sri Lanka series that it was down to the selectors to decide his future there was an underlying sense that he had invited them to act. England are now left with three captains in three different formats, with Stuart Broad the incumbent in T20 cricket. There is no expectation at present that Cook will lose his Test captaincy and, as Morgan is a long way from the Test side, it is difficult to see how such a bandwagon could gain momentum. With England involved in a non-stop schedule of international cricket for the next year or more, Cook now has a chance to to restore his energy, regain certainty in his game, and lead England in Test series against New Zealand and Australia next summer. Tillakaratne Dilshan hit 101 and took 3-37 to condemn England to a crushing 87-run defeat and seal a 5-2 series win for Sri Lanka. Aged 38, the oldest player on the field marked his 300th one-day international with his 18th century to help the hosts to 302-6 in the final match in Colombo. Dinesh Chandimal struck 55 not out and Thisara Perera flayed 54 off 26 balls. Although Joe Root made 80 despite an ankle injury, England were bowled out for 215 with 4.1 overs unused. The tourists never threatened to overhaul an imposing target, allowing Sri Lanka legends Mahela Jayawardene and Kumar Sangakkara to savour a comfortable victory in their final ODI on home soil.